The one-half ounce gold medallion released for the fourth year of the American Arts Commemorative Series features sculptor Alexander Calder. His artistic works include sculptures, theatrical productions, monumental works, painting, and jewelry. He was the creator of the mobile, a moving sculpture made with delicately balanced or suspended shapes. The obverse design of the medallion features a left facing three quarters profile portrait of the sculptor with a broad smile and affable expression. On the reverse is the image of one of his kinetic sculpture creations with a representation of his signature. The inscriptions on the obverse read “United States of America” and “Alexander Calder” with the date “1983”. The reverse inscriptions are “American Arts Commemorative Series” and “One Half Ounce Gold”. 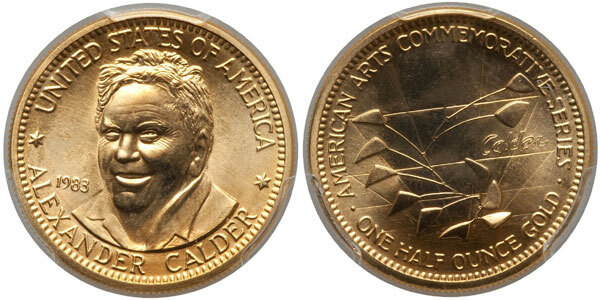 The reported mintage of the Alexander Calder American Arts Gold Medallion was 410,000 pieces. From this amount 75,571 were reported sold to the exclusive distributor of the medallions, J. Aron & Company. As with other issues of the series from this period, the actual sales to the public were far less due to lack of demand. Since the unsold pieces are believed to have been melted, the actual distribution and surviving population is extremely limited. Due to the limited distribution and impact of melting, it is believed that the Alexander Calder Gold Medal is the key issue of the series. The actual supply of pieces on the market has been estimated to be as low as 8,000 pieces, resulting in premiums well above the precious metal value.